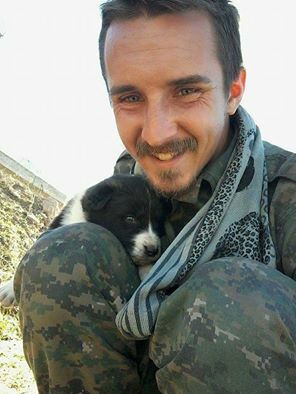 Memorial video for the anarchist internationalist fighter of Rojava Haukur Hilmarsson (Sahin Huseyni). Sehid Sahin has fought against I.S. (DAESH) in Raqqa and martyred while he was defending Afrin from Turkish State’s military invasion. A minimum response on the call-out for the day of Rage against the massacre at Aleppo. Even if there are only ruins left at Aleppo, the bombings haven’t stopped. Even now, after 5 years of bombs and sieges, people still live in this city. Some because they didn’t manage to leave, some because they didn’t see a better future at Mediterranean’s seabed, some because they refused to abandon the revolution against the dictatorship of Assad, that started with the Arab Spring. At Aleppo’s ruins a guerilla warfare is taking place, that until now, Assad with Hezbollah, Iran and Russian military machine haven’t achieved to defeat. If the things that happened with the repression of Spanish Revolution by Franco and the Nazis were the rehearsal of World War II, probably the war in Syria is an image of the post-industrial future on earth. A future, where the democratic excuses collapse and the absolute violence prevails. A world, that despite the gigantic military power of the tyrants, the most effective way to control the insurrection is still by division. A situation of despair, where people in order to defend themselves and survive, are organized in groups manipulated by generals, who only seek more power and who lead the revolting crowds away from the fight against the regime and into a fight for control of the war zones of their interests. The result is a constant war, a profitable business for the capitalists, who sell weapons and armament to war zones, where trade and economy still exist. The example of Syria’s punishment is a clear warning to everyone in the world, who even thinks about revolting. In this chaotic total war, the reference point for us, are the few guerilla groups, organized outside the control the “moderate Muslims” of Al Nusra, or the “cosmics” of the FSA, who are both manipulated from the dominant powers of imperialistic competition, like USA, and both have the same target, a big piece from the power reallocation. In a situation where people are cruelly attacked from one imperialist, and seek safety from the actions of its rival, we are affected by some revolutionaries, like the Leon Sedov Brigade, who stand against any imperialist and propose the solidarity and unity among the repressed of this world. We are inspired from the attempts of organization from the Revolutionary Coordination Committees against the dividing of the uprising, from the manipulant organizations. Those rebels who try to self-organize in a battlefield with bombs and chemical weapons, who are still fighting despite the heavy losses, who prefer to die rather than surrender to the murderer Assad, who define and defend their freedom at all costs, they spread the message that in every condition struggle is possible, if there is the will to fight. They spread a message that the powerful military machines of Al Assad, Iran, Lebanon, Isis, Russia and USA haven’t achieved to defeat them for more than 5 years. That explains the cruelty of the attack to Aleppo, the capital of revolution. After smaller towns were besieged and lead to starvation, the same tactic was attempted at Aleppo. But there were dynamic demonstrations where banks were expropriated, actions outside the guidelines of the army parties, which control the masses. That’s why Aleppo is now being totally destroyed. A major factor for the ongoing slaughter in Syria is the absolute absence of social resistance to this war, from the people of the imperialistic countries that invaded Syria. European people, not only they do not react to the war, but the majority consent to the closure of the borders for refugees, who, if they survive from the death in the sea, are the only fighting, like the great example of Syrian refugees in Paris who went on hunger strike, demand the termination of the war. We don’t have a clear picture of what happens in movements in the rest of the world, but we are going to talk for the Greek case. Because after all, the economic crisis and poverty here in Greece, except from radicalizing parts of the people, lead more to the pacification. On the one hand we have people who take care of the refugees, rescuing them with their boats, independently from political parties and non-governmental organizations, and on the other hand there were beatings, fascist attacks and actions against the refugees. No big anti-war demonstration though, as happened in the past, because now economy is the only concern. Using it’s left mask, Syriza combining fear management and harsh repression, lead social resistances, in general, to surrender. And now Greek state is placing refugees to concentration camps, obeying the demands of the European Union. Sadly, the solidarity to the refugees is limited to charity, without any reference to the revolution, that lead to war. For the lefts, the “anti-american” feelings and the belief that “the enemy of my enemy is my friend” doesn’t allow them to stand against Assad, while the majority of the anarchists, lacking analysis, refer exclusively to Rojava. At the same moment, refugees give their own fights like the uprising in Moria, where after destroying a large part of the infrastructure, they escaped, but rather than run, as usually happens, they gathered and demonstrated, resulting their arrest. In our opinion, we seek the expansion of the solidarity to the refugees, in a more general context, that will regard the war in Syria as an example of an uprising and how capitalists dealt with it, in order to be able to exclude the proper conclusions from it. It’s obvious, that the unity of the rebels doesn’t come from the big, centralized, hierarchical organizations, that end up fighting each other for the biggest share of power. The only hope is a horizontal organization, that doesn’t allow to any ambitious leader to sell the fight. The decentralized network of collectives that fight with their one will to a common direction, coordinating when possible, exchanging information, know-hows, arms and political ideas. The views that see hierarchical organization as a necessary condition to achieve victory in a revolutionary war, were tried in the past and were lead to defeat or to the reproduction of the same social systems that they hypothetically fought. The example of Syria, where small guerrilla groups and no centralized armies stand against the Russian military machine and the alliance of local armies, proves that what is missing is not the proper leadership, but a new mindset of organization. And that applies to every field of organization of revolutionary action, whether it is guerilla warfare, or the spread of revolutionary ideas, that do not persuade anyone because they are signed by the biggest federation, but are spread through initiative, close human contact, and co-action. The massacre in Syria won’t stop, unless we do something to stop it. Unless we face it as a part of the repression that we all have felt. If we don’t feel the tenacity of the rebels who don’t surrender. If we don’t realize that the distance from suffocating because of tear gas in demonstrations to the endless gas chamber of Syria is short. As long as we abstain from the streets, we give our permission to this bloodshed. When captivity and death become universal condition, we are called to make insurrection and solidarity a universal condition. 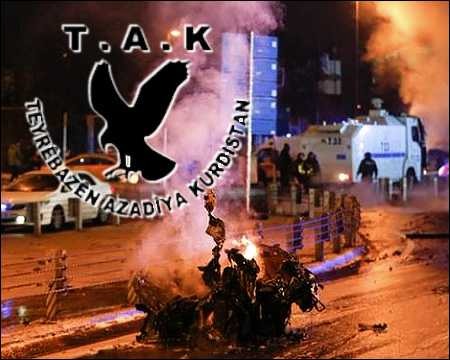 It is not a secret to any observer the relationship between Turkey’s ruling Justice and Development Party (AKP) with all the armed groups in northern Syria. It began in Ras Alain and did not end in Afrin. The AKP’s arguments revolve around changing the Syrian regime, bringing democracy to Syria, protecting Christians and Sunnis and unifying the country. These arguments have proven to be mere pretexts used by the AKP to intervene in Syria. The only goal of the AKP is to fight any democratic project for the future of Syria. To achieve this, the AKP has co-operated with the so-called Islamic State (Daesh) through providing training, supplying arms and facilitating the crossing of Daesh fighters to Syria through its borders. Here are some compelling evidence for this cooperation through documents and confessions obtained by the People’s Protection Units (YPG) throughout their operations in Rojava – north Syria. Anti-Fascist/Anti-ISIS graffiti by the comrades in Newcastle Upon Tyne UK. The International Freedom Battalion is an armed group consisting of leftist foreign fighters fighting alongside the People’s Protection Units in the Syrian Civil War in support of the Rojava Revolution and against the Islamic State of Iraq and the Levant.